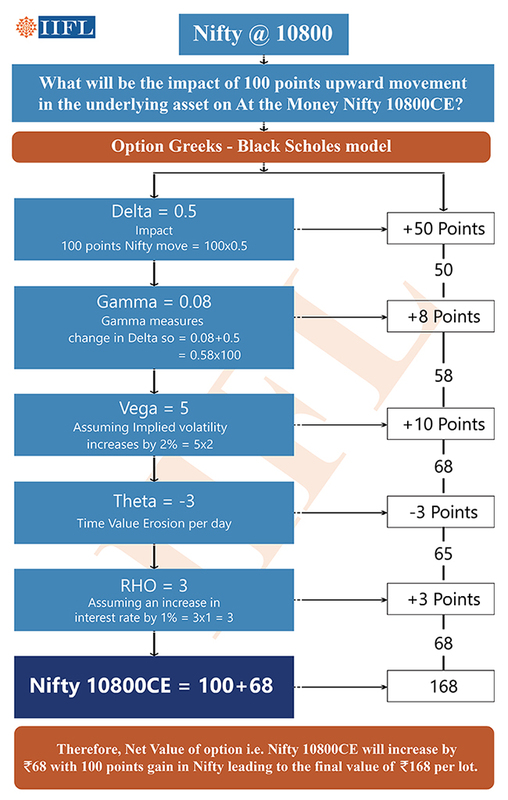 It is of paramount importance to master the Greeks which includes 5 components that is Delta, Gamma, Vega, Theta and Rho in order to study the effect of the change in underlying value of options price. Ancient scriptures dictate that it is through the 5 elements of nature that created a man. Each element played a significant role in defining the persona of the creation. In the Options world, there is technique for which we can be stated as the Panchtatva of options trading. More commonly in the trading world this is known as the ‘Option Greeks’, which finds their roots in mathematical models like Black-Scholes and Cox-Ross-Rubinstein. It is of paramount importance to master the Greeks which includes 5 components that is Delta, Gamma, Vega, Theta and Rho in order to study the effect of the change in underlying value of options price. Consequently, this practice based on theoretical valuations helps to build a concrete rationale to take an informed trading decisions which otherwise could prove to be a nightmarish experience if driven by blind faith, half-baked advice or reckless choices. Furthermore, to maintain a large trading portfolio efficiently thorough knowledge of ‘Option Greeks’ is very important. Let us understand the basic concept of Option Greeks. Delta measures the change in option price for a unit change in the price of underlying asset. So if a Delta of the Call Option contract is 0.5 it shows that for each unit increase/decrease in underlying asset, option price will increase/decrease by 0.5 points. Delta of call option is always positive and delta of put option is always negative. When you Buy a call option, delta of your position is positive and when u Sell a call option, delta of your position is negative. When you Buy a put option, delta is your position is negative and when u Sell a put option, delta of your position is positive. So basically, Delta measures the probability/chance of the option contract to become/remain In-the-money (ITM) at the end of expiry. Gamma measures the change in Delta with respect to per unit change in underlying asset. If Gamma value is 0. 08, it shows that Delta will change by 0.08 points if underlying assets changes by 1. So Gamma shows what will be the next change in Delta with respect of change in underlying asset. Gamma of Option is always positive. Gamma of Call and Put Option is same for the same strike. Gamma is highest at At the Money (ATM) and decreases as Underlying moves away. Gamma of Future is 0. So basically, Gamma indicates how fast the Delta would change as the underlying price move. Higher Gamma is always riskier than lower gamma even if the Delta of the option remains the same. Vega measures the change in options price per unit change in volatility. Vega is directly related to the option price i.e. higher the volatility (implied volatility) higher the option price and vice-versa. For example, A Vega value of 5 shows that for every unit increase in volatility, option price will increase by 5 points. Thus, Vega shows effect of volatility on option price. Vega of call and put option is always positive so an increase in implied volatility increases the value of both call and put options. Higher the Vega, higher is the value for both call and put options. Vega is highest for ATM options with more numbers of days to the expiry, while the opposite is true for Out of the Money (OTM) options with few days to the expiry. Option strategies like Long straddle & strangle have positive Vega while the strategies like Short straddle & strangle have negative Vega. Theta measures the rate at which the option loses its time value as the expiration date draw nearer. It is the rate of decline in option price due to the passage of time. If theta is -3 and everything else is constant, option value for the particular day will erode by 3 points. Theta of call & put option is always negative. Impact of the Theta on call & put option will be higher as the expiry nears. Theta value is directly related to Vega. So basically, Option writers’ benefit from the higher Theta value while Option buyer benefits from the lower Theta value. Rho measures the change in options price with unit change in rate of interest. If Rho of put options is -3 it signifies that for each unit increase in interest rate, put option price will decrease by 3. Rho is directly related to call options and inversely related to put options. Increase in interest rates increase the value of call options and decreases the value of put options. Rho is larger for In the Money (ITM) options and it steadily decreases as the option changes to become OTM. Rho increases as time to expiration increases. Rho is considered to be the least important among all the Option Greeks, as the change in interest rate has minor impact on the option pricing.